MAJESTIC HARBOR is by ROCKPORT HARBOR, black-type stakes winner of 5 races, $324,800, Remsen S (G2), Nashua S (G3), Essex H (G3), 2nd Rebel S (G3). First Foals are Yearlings in 2019. MAJESTIC HARBOR (c, by Rockport Harbor). Black type winner, see records. DANZA (c, by Street Boss). Winner at 2 and 3, $866,428 in US. Won Arkansas Derby [G1]. 3rd Kentucky Derby [G1], Saratoga Special S. [G2]. Tickled Pink (f, by Shackleford). 2 wins at 3, $77,160 in US. 3rd Caesar’s Wish S.
Totally Tucker (f, by Elusive Quality). Winner at 3 and 4, $95,293 in US. Dam of 1 winner. Totally Boss. 2 wins at 3, 2018, $71,386 in US. Super Steed. Placed at 2, 2018, $13,400 in US. A Shin Paraiso (c, by Zensational). At 1 Sent to Japan. Winner at 3, 4 and 5, in Jpn, $290,839. Champagne Sparkle (f, by Street Boss). Unraced. Producer. Technocat (g, by Saint Ballado). 8 wins, 2 to 6, $264,141 in NA. 3rd Cisk S. (HAW, $4,840), Presidents S. (TP, $4,000). Champagne Royale (f, by French Deputy). Black type placed winner, see above. ALL THEE POWER (c, by Lines of Power). 3 wins at 2 and 3, $199,000 in NA. Won California Derby [G2]. 2nd Bradbury S. [LR] (SA, $15,000). Sire. Dirty Harryette. 7 wins, 2 to 5, $160,838 in NA. Placed at 6, $9,540 in US. (Total: $170,378) Producer. Clever Comique. Winner at 3, $17,860 in NA. 4 wins at 4, $64,420 in US. (Total: $82,280) Producer. Clever Tip. 2 wins at 3, $51,100 in US. Continental Dancer (c, by Noble Dancer (GB)). 4 wins at 3 and 4, $56,493 in NA. 3rd Palisades H. At 5 Sent to Italy. At 3 Cnr Meadowlands 1 1/16m 01:43.60 (T). Sire. Decorated Weekend (g, by Well Decorated). 13 wins, 2 to 8, $102,533 in NA. 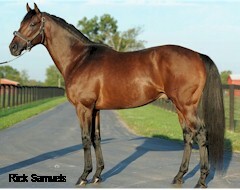 Markham (g, by Unbridled). Winner at 3 and 4, $26,556 in NA. Weekend Bash (f, by Advocator). 3 wins at 2 and 3, $13,580 in NA. Alight (g, by Majestic Light). Winner at 4, $11,402 in NA. Week End Prospect (c, by Tank’s Prospect). Winner at 3, $9,930 in NA. Another Grey (g, by Pine Bluff). Winner at 5 and 6, $9,070 in NA. How ’bout Tuesday (f, by Tromos (GB)). Unraced. Producer. Relocated to Harris Farms for 2019! MAJESTIC HARBOR won the Grade 1 Gold Cup at Santa Anita by a widening 6 1/4 lengths, posting a 111 Beyer Speed Figure over GAME ON DUDE (G1), LIDERIS (G1), SALTO DEL INDIO (G1), CLUBHOUSE RIDE (G2), IMPERATIVE (G2), and FURY KAPCORI (G3). MAJESTIC HARBOR was on the board in 31 of 42 starts, including 14 times in Graded Stakes, and he competed in the 2014 Breeders’ Cup Classic (G1). Graded Stakes wins included the (G1)Santa Anita Gold Cup S., (G2) Alysheba S., (G3) Mineshaft H., and (G3)Tokyo City Cup S, and he was on the board in the (G1) Stephen Foster H. (twice), (G1) Awesome Again S., (G2) Marathon S.,(G2) Californian S., (G2) New Orleans Handicap, (G2) San Pasqual S., (G2) Hawthorne Gold Cup H., and (G3) Greenwood Cup, etc. MAJESTIC HARBOR outran the likes of FORT LARNED (BC Classic-G1), DRILL (G1) GAME ON DUDE (G1), EFFINEX (G1, 2nd BC Classic-G1), NOBLE BIRD (G1), MORENO (G1), WILLYWONKER (G1), etc. at classics distances of 1 to 1 1/2 miles. A grandson of UNBRIDLED’S SONG, MAJESTIC HARBOR is a half-brother to (G1) Arkansas Derby SW DANZA (101 Beyer, $866,428, 3rd (G1) Kentucky Derby).